This morning started out like most others, I woke up to go to work. The only difference was I was waking up at 12:30am so I could be at work at 2am. Yeah, I wasn't too happy about that at all, but as they say...."Duty Calls." I completed my special assignment, and was done with my work day by 10:30 which left me with a lot of day when I would normally be cooped up in my office. What to do? What to do? Well, I had been out several times lately with my camera without any success. I was really wanting to get some new images added to my gallery, so I kept thinking of places to go. While working my strange schedule, I was trying to come up with some ideas of places to go, but nothing really popped out at me. My goal here of late has been to find some old cars to photograph, but I just wasn't feeling like doing that today. Instead, I was kind of craving the solitude of a hike in the woods. After a lot of internal debate, I decided that Stone Mountain would be my destination. If nothing else, I would have my choice of subjects depending on the conditions. There was everything from waterfalls, to grand landscapes, to intimate landscapes, with a few rustic subjects mixed in for good measure. 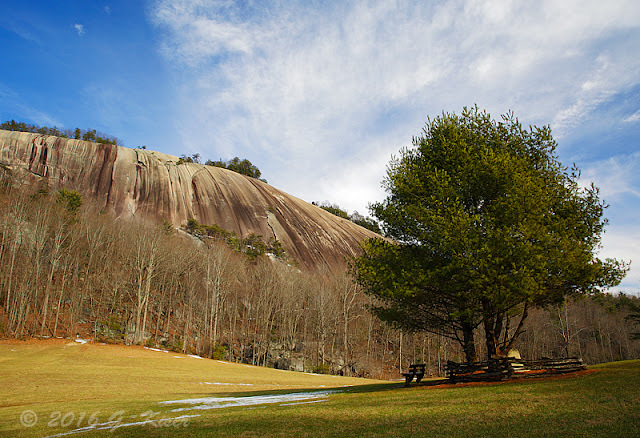 After work, I set course to the West and found myself at Stone Mountain before lunch time. The conditions were perfect for some intimate landscapes, and I was please to see that there was still a lot of snow on the ground. 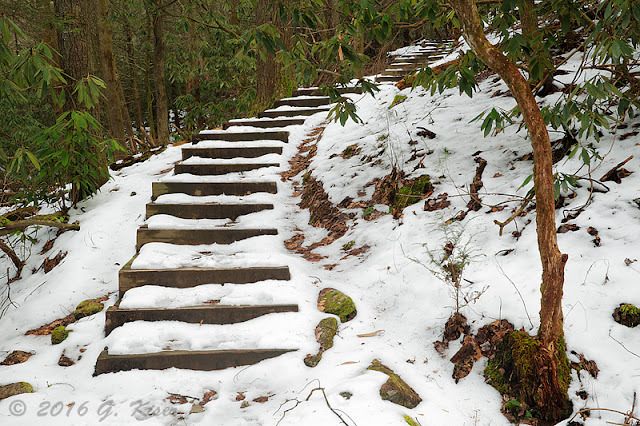 I quickly decided that my best bet would be to take the low level trails that would lead to the Stone Mountain Falls. 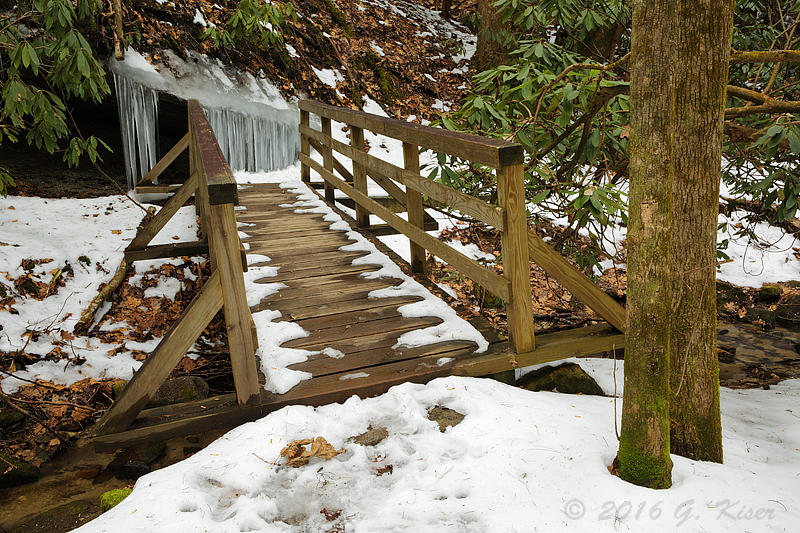 I wasn't interested in photographing the waterfall, but I knew that there should be plenty of subject matter along that trail. 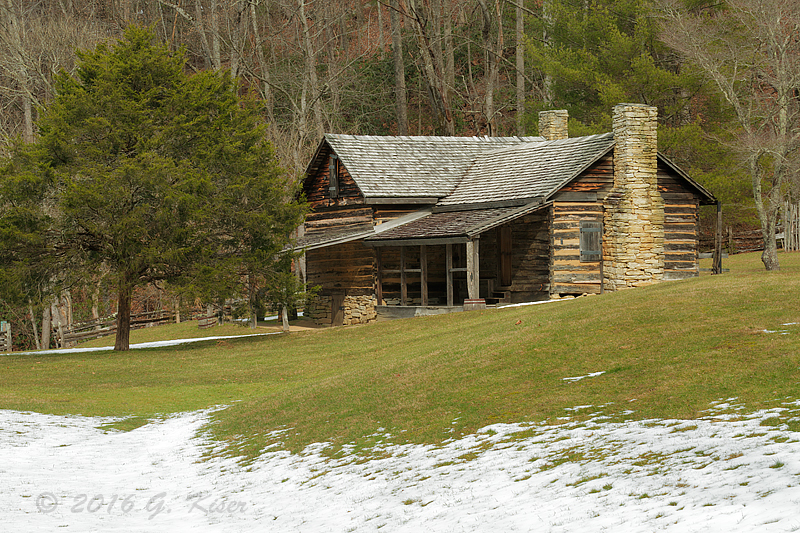 My first stop on the trail was the restored homestead just off of the parking lot. There are several structures there which are interesting to photograph. The only downfall is they mostly have some sort of display by the front of them. This gets in the way of photography, and is something that I try to avoid. I was about to bypass this setting since I had photographed it so much in the past, but as I was crossing the bridge to the trail, I looked back and the view of the main house caught my eye. I had never shot this with my 70-200mm lens before, and from this distance, that would be a perfect choice. There was even a good amount of snow at the base of the scene which I had never captured before. I decided that I should set up and give it a try. The compositions seemed to come quickly and effectively with my chosen lens. I found that 100mm was the sweet spot for the composition, and using a CPL filter helped with the contrast of the scene. I was very happy with the outcome to say the least! 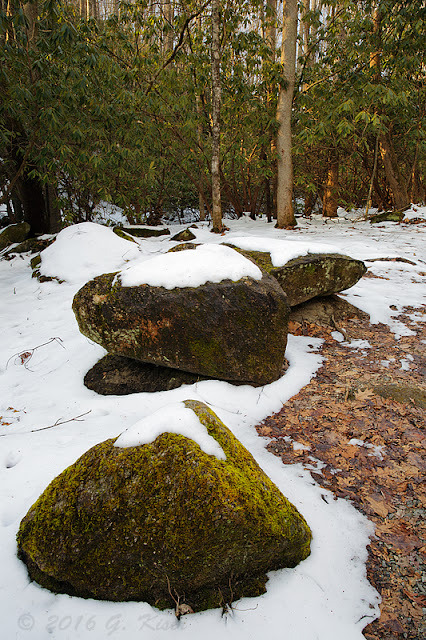 After I got back on the trail, I started to look for some intimate landscapes to shoot. 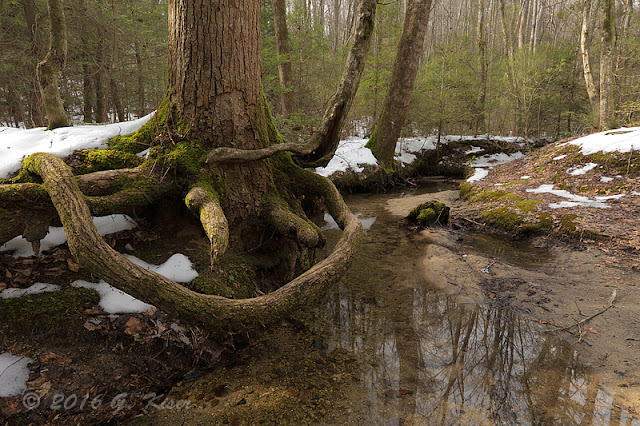 One of my favorite subjects was along this trail...a tree along the stream with an exposed root system. I have photographed this many times before, and was looking forward to trying something a little different today. Unfortunately, the clouds were starting to break up and the sun was shining through. This was going to make my exposures very difficult with the contrasting light. Even so, I found my tree and set the camera up using my 16-35mm lens to exaggerate the root system. 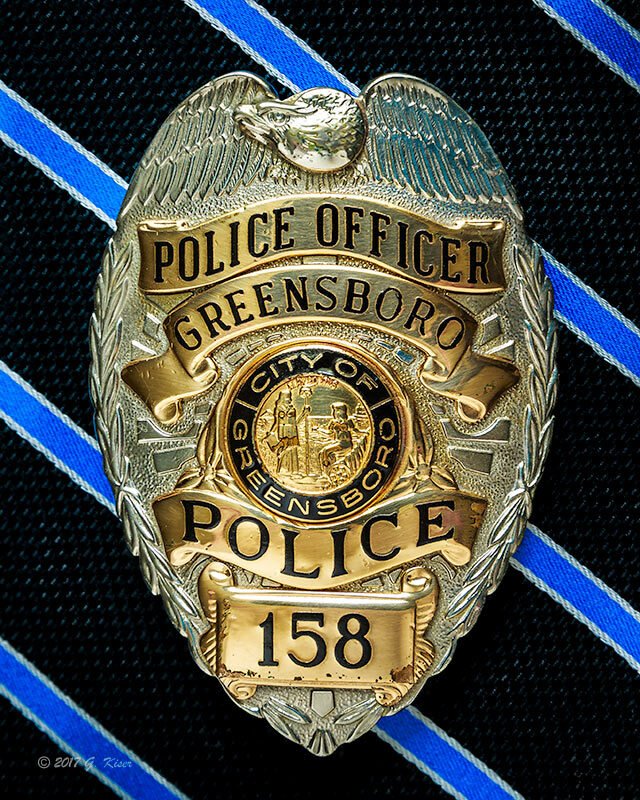 I added a CPL filter, but resisted the urge to engage it fully. Instead, I opted to leave a little bit of the reflection in the water since there was so little water standing. The hardest part of this shot was waiting until the sun dipped behind some clouds reducing the contrast of the scene. When it happened, I was ready after several test shots. Having only a few seconds to work with the good light, I snapped the shot and found that I had nailed the exposure I wanted, and the composition was spot on. Even the reflection was just right. Time to pack up and move on. The lighting was getting worse as I got deeper into the park. I was committed to this route though, and had to stick it out. I realized that I might just be on a long walk for the fun of it as there was just too much light working through the trees. Every once in a while I would come across some shaded areas, but rarely was there anything worthwhile in those areas. At one stream crossing, there were three stones which I had passed by many times before without a second thought. Today, however, the snow added a dimension to them that gave them a different character. The fact that they were in the shadows really helped out as well. I went ahead and set up to see what I could do with them. I used my 24-70mm lens with an enhancing CPL filter to capture this one. I chose to shoot vertical to capture the hint of a curve leading out to the trees in the background. I actually liked the hint of sunlight on the tree trunks as well which help to bring the eyes into the background. As I worked my way back to the parking lot the sun started to dip below the horizon of the mountain. This effectively put my side of the mountain in the shadows. This worked out great for lighting as everything became nice and diffused. One stair case that I had gone up originally, now had a certain picturesque quality about it as I came down. Once at the base, I brought the camera back out and set it up once again as I had on the last location. While this composition looks very simple, there was a lot of fine tuning that went into how the camera was set up. I wanted to get the stairs captured all the way to the top, however, the tree to the right tended to cover the top portion. There was just enough of a void in the leaves to where I could position the upper steps just so, and keep them in the picture. It took a good bit of fiddling, but I was able to get get it just the way I wanted it, and grab the shot as I had seen it in my head. I was getting close to the truck, but still had to work my way through the old homestead once again. This time though, the sky was clearing and the clouds provided some nice interest. The warm light from the low sun, just over the mountain was painting some nice tones on Stone Mountain. this was going to be my chance to capture the mountain in ways I had not done previously. 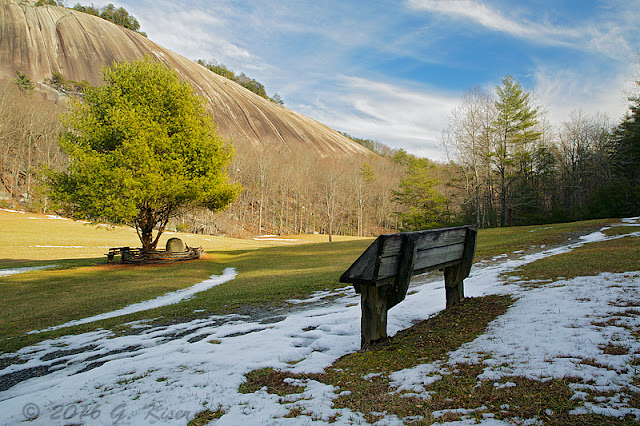 Normally, I try to avoid the benches that are set up along the trail, but today, I decided to embrace them. Using my 24-70mm lens with a regular CPL filter, I was able to capture a composition that included the bench, the sunlit tree, and the distant mountain. The blue sky with the strands of clouds above completed the scene. This is probably one of my favorite images I've shot of this mountain. There is very little that I would change about this one. I decided to take the long way back to the truck which took me back into the trails. I'm glad that I did because I never would have seen several of the bridges along the trail. As the snow had been melting, it had developed a pattern that resembled teeth along the wooden planks. When I got to the bridge, the little voice in my head (that sounds like Toni) told me to stop and take a picture of this. I have to admit, I wasn't sold on the idea, and it took a long time to get the shot set up the way I wanted it. But, after I found the right location, and found the right focal length on my 24-70mm lens, I decided that Toni was absolutely right about this one. There was a lot to like about this scene, and it would not have been the same with either more or less snow. This was "juuuuusssst right." In fact, I was having so much fun with this bridge, when I came upon the next one, I automatically started looking at it for a composition. From a distance, it didn't look all that exciting. However, once I got up close to it, I found something that made this bridge pop. The runoff from the rocks in the background had been freezing for the last week or so and had created an icy curtain just on the other side of the bridge. This was the eye candy that the bridge was going to lead to. 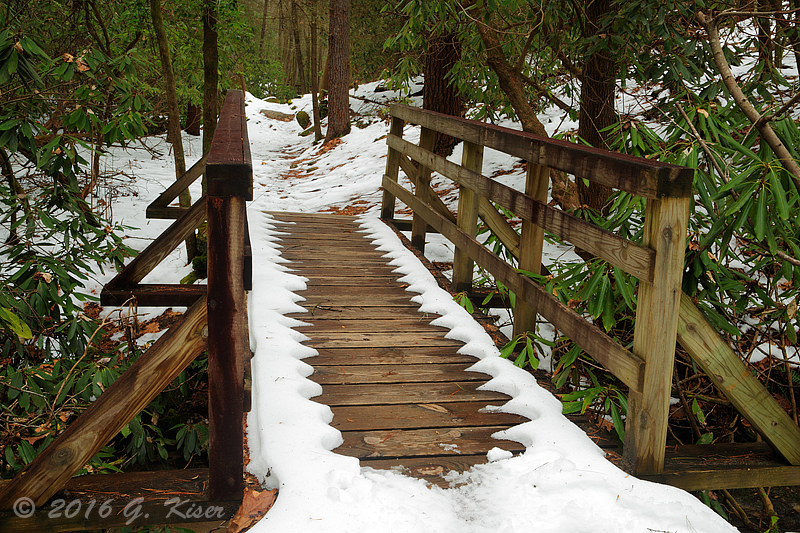 Of course, it still had the neat repeating patterns of snow on the wooden planks, but without the icy curtain, there wasn't much to this bridge. The last one might have taken a long time to compose, but this one felt like it took about twice as long. I'm not sure what the difficulty was, but I just couldn't find the right perspective for the longest time. When I did finally decide what elements to include and how to include them, it fell into place quite nicely. I'm glad that I put that extra effort into making this photograph work. At the end of the day, I had shot 63 frames in about 5 hours. I was optimistically expecting to have about six keepers out of that when I was finished editing. To my surprise, I ended up with eight photographs that I was happy enough with to keep. After a week of less than stellar conditions for my camera, I was starting to wonder if I was losing my touch. It was very nice to be able to get out and really concentrate on creating photographs again, and make them work out as well as they did. I guess in the long run, getting up at 12:30 this morning wasn't a bad thing after all. It was kind of a spur of the moment thing, but I decided that as the day came to a close, I would head out and try to capture some pictures with the last bit of light. I had no particular destination in mind, but I wanted to explore in some areas I haven't been before. 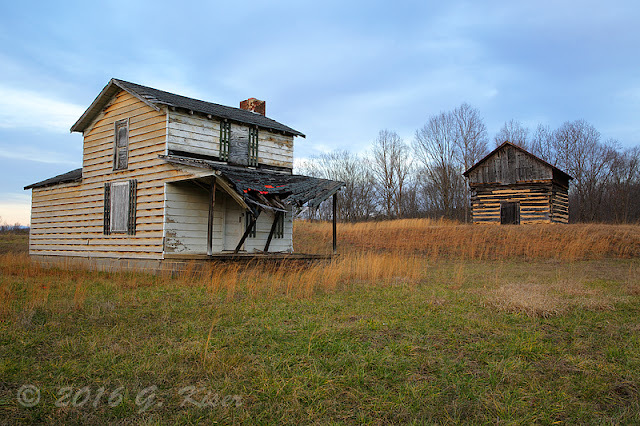 I picked North as my general direction and skirted along the back roads past Walnut Cove. I eventually found myself on Hwy 772 going into Surry County. 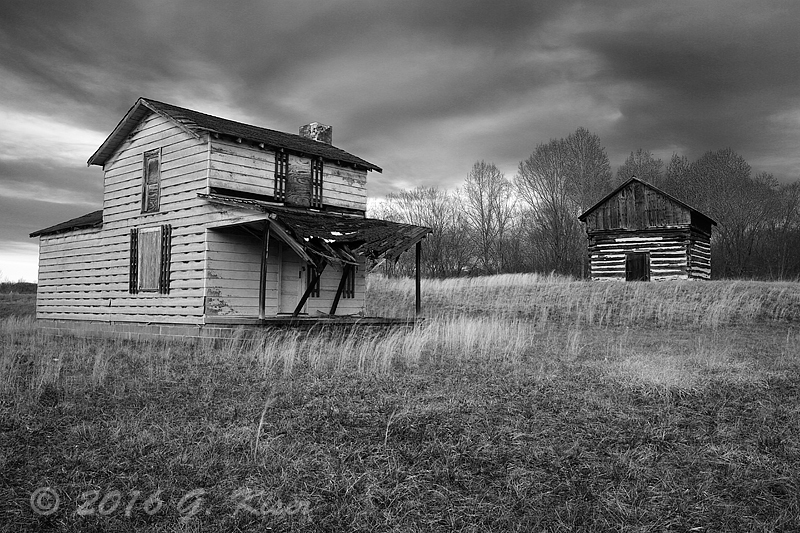 There were a lot of old barns out that way, but what I was really wanting was some old cars to photograph. I happened to find one, but the sun was on the wrong side, so a picture wouldn't work out very well. I did file it in my mind for another time though! 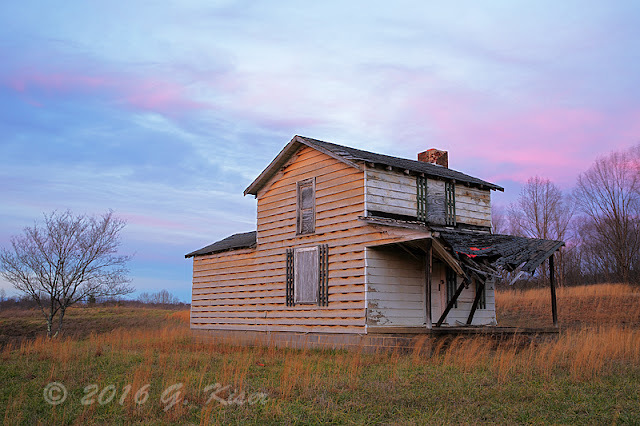 I had been driving for nearly a hour and was about to hang it up for the day when I came across an old house with a few barns nearby just sitting all alone on the side of the road. This one called out for me! I got the camera built quickly because the light was fading fast. I started out with some general compositions that lead me to the opening picture for this entry. The clouds looked amazing with just the right amount of texture, and there was still enough light on the house and barn to keep it interesting. I worked on fine tuning the compositions quickly and I moved on to something different. The light was changing almost by the second, and I noticed that there was a good deal of pink sneaking into the sky above. I went back to the compositions that I knew would work and shot them again with the color in the sky. I'm still not sure which I like better, but I think that they both have very different emotions behind them. They are strong enough to stand on their own individual merits I think. I continued to shoot different images as the light changed. I was also keeping an eye out behind me where the sun was dipping down to the horizon. I didn't want to miss anything special. As the sun dropped, I noticed that it was actually going into a dip in the landscape that was highlighted by the roadway. This was going to make for an interesting picture if I could compose it just right. There was no time for filters, so I just shot it with what I had available at the time, which was a bare 24-70mm lens. Not having a grad filter on, made the exposure a little complicated. I wanted to maintain lots of detail in the foreground since there was a house in it. I had to really watch the histogram as I selected the right exposure. When I was satisfied that I had plenty of detail on both sides, I released the shutter. To my surprise, the image popped up on the LCD with the actual recorded histogram and it looked like I had nailed the exposure. I was going to have to wait until I got home to really see, and as you can see above, I got pretty close. With the sun now out of the picture (pun intended), I turned my attention again to the other side of the sky. 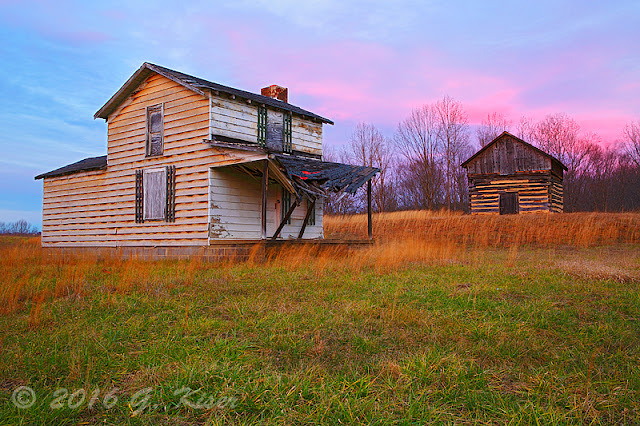 There was still some color above, and the light was still adequate and soft on the property. I went back to working other compositions to take advantage of what I had before me. The house itself was a little on the plain side, but the collapsed front porch really caught my attention. It gave it character, but there still wasn't enough there to carry an entire picture. Now with the sky changing colors, there was some more visual interest to work with, and once I included the bare tree to the left as another point of interest, the composition began to work a little better. The star of it is still the house, but there is a lot more to this picture than just the house. Having given the house the solo treatment, I decided that I would also work the barn on the hill by itself as well. The color in the sky was fading, but the clouds were still heavy and full of soft textures. 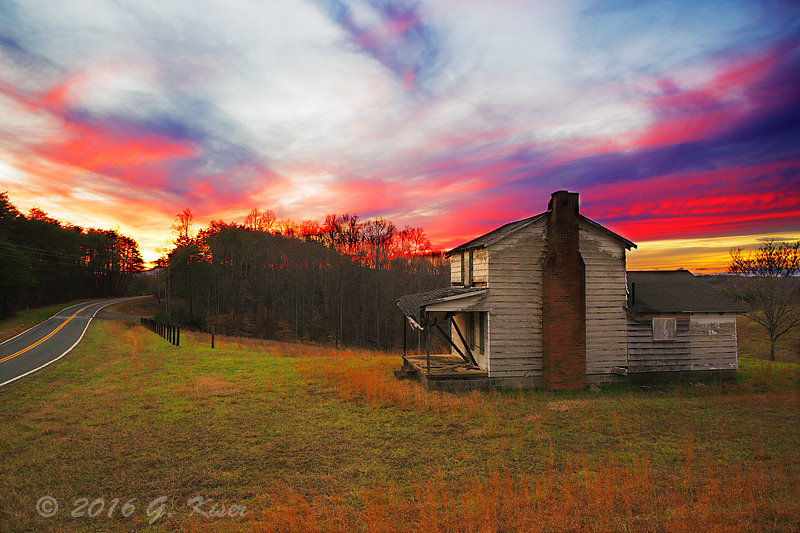 For those who live in NC, this sky just looked like a snow sky, and I wanted to incorporate that into a picture with the barn which was full of warm tones. The soft blues of the sky dominate the majority of the frame, but the warm tones of the barn, both red and yellow help to balance the color palette. The dormant grasses at the foreground help with that as well. A visual balance is provided by the distant roof of the next barn. This makes for a simple picture, but one with a lot to look at...which is just how I like them. I was probably out on this property for about 45 minutes. In that time, I shot 24 frames. I was only expecting a couple of pictures to turn out, but I was pleasantly surprised to see quite a few of them turned out much better than I had anticipated. One of the first pictures I shot, I had envisioned in monochrome to make the best use out of the contrast in the sky. When I started going through the pictures in the final editing process, I made the conversion and was very happy with the outcome. The monochrome treatment really seems to take the viewer back in time. It adjusts the feel of the scene, and sparks the emotions more effectively than the color version. While I like both, the monochrome is my favorite of the two, and actually, this is my favorite from the day. This is my first Trek of the new year, and I was able to do it side by side with Toni as we celebrated our 5th wedding anniversary. Each year we head out to Lansing, NC to stay at our favorite little cabin in the woods. If time allows, we also typically go out and explore in the area, and if I'm lucky, I find a few subjects to put in front of my camera. This year wasn't any different, but the weather refused to really cooperate with us when it came time to trip the shutter. It seemed that daily, the weather forecast would change, and that pretty much left us with no idea what to expect for the long weekend. We got in after dark on the eighth, and we relaxed in the cabin until the next afternoon when we struck out to see what was out there. I thought that I had explored most of the directions away from the cabin, but that wasn't the case. We found a lot of new roads very close by and started scouting. The lighting was very good with heavily overcast skies. The down side to that was that the clouds were bringing in rain which would come and go. We found a lot of different subjects, but with the rain, there was little that could be done, and the sky needed some visual interest for these subjects to work. After a couple of hours out scouting, it was clear that this was not going to be the day for the camera. We grabbed a bite to eat and headed back to the cabin. The next day was a little more of the same with heavily overcast skies, but instead of rain, there were snow flurries. The biggest part of the weather story was the 20-40 mph winds that were supposed to be around all day long. Normally, I wouldn't head out in that kind of wind, but I really wanted to get some pictures, and I was excited about all that we had seen yesterday. Once we left the cabin, my excitement dwindled as the wind chill was in the single digits. This was not going to be fun. The wind was shaking my truck as we curved through the mountain roads. 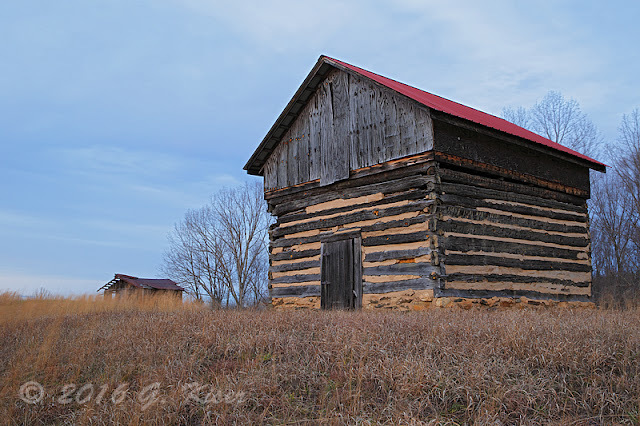 We made some new turns along the way and saw a lot of other really outstanding barns, but for one reason or another, they all seemed to be plopped right next to modern houses, or other visual distractions. I was coming up with nothing as we drove around, until we crested a hill and made a slight turn. Toni and I both saw it at the same time and saw that it was isolated well enough for a photo attempt. The biggest issues I had with this particular barn was that there was a house across the street with a few cars in the driveway. 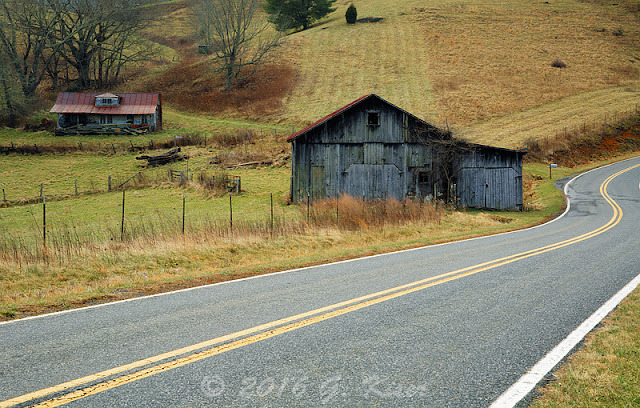 It was far enough removed that it wouldn't bother the barn, but I really wanted to incorporate the roadway as a leading line in this composition. I got out of the truck and started to set my camera up in a shelter next to a graveyard in an attempt to get out of the wind. It only marginally worked, and I had a very hard time putting things together with the gusts. 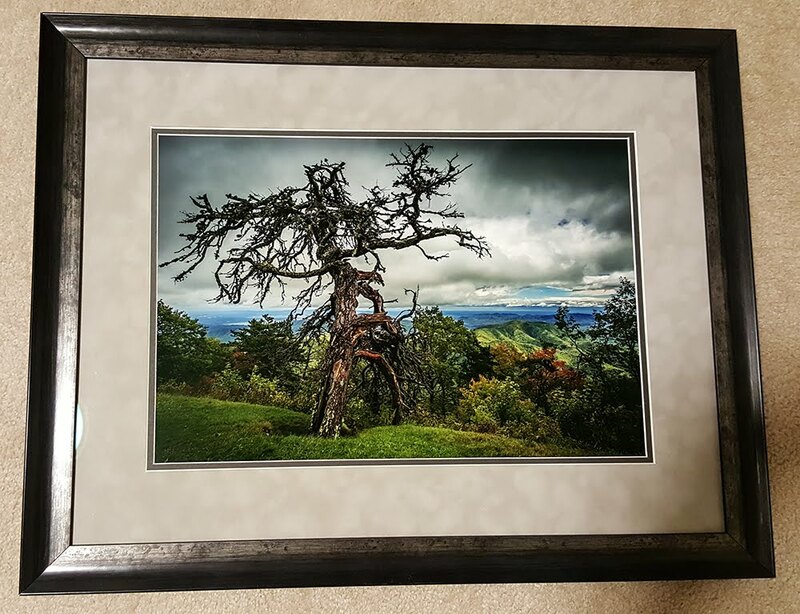 I was able to get everything mounted and I started working my way down the road grabbing different compositions as I walked. Within minutes, I could no longer feel my fingers, and my nose was pretty much running non-stop at this point. I continued to dial in the exposure settings on the camera the best I could, and tried to time the shutter releases between gusts to get the sharpest images possible. My favorite composition from this location was one that incorporated an old house in the background just to the side of a second leading line. All of the elements were there to pull the viewer into the scene. As I got closer, I lost a lot of the depth to the image. I tried a couple of other subjects in this area as well, but I was just unable to make them work, partially because I was starting to suffer from frost bite. The other reason, I wasn't able to mount any other filters on my lens because I needed the hood to keep the snow flakes off of the front element. Knowing that I was getting very close to losing all fine motor skills I went back to the shelter and broke down the camera and tripod. That was a trick and a half considering my fingers no longer worked beyond about 50%. Once back in the truck, my fingers were stinging as the blood started to occupy them once again. After I regained the feeling in my fingers, I was once again on the hunt for a photograph. I had grabbed the official first shots of 2016, and I was hungry for more. The snow was getting heavier, but the wind was seeming to die down a little, or maybe it was just on the other side of the mountain. Either way, I was feeling better about being outside of the truck with the camera. I was doing my best to get us as lost as possible in the back country roads of Ashe County. We were well into farm lands, and there were so many barns out there I was getting overloaded. I decided that I could be picky about what I was shooting at this point because there were so many worthwhile subjects along the roads. This next stop is a prime example of why I love having Toni's company on these motorized Treks. As I was navigating a new traffic pattern as a bridge was being repaired, my attention was right on the road (where it should be). However, Toni was free to look around and she got excited when she saw a barn to our right. I turned just in time to get a quick glimpse of it. I wasn't able to see detail, so I filled in my visual blanks with questions to Toni. Everything sounded wonderful about this barn, so we got turned around. There was not much in the way of shoulder to pull off on, but there was enough room between the orange barrels that I was able to get safely out of the roadway, and in a position to work the barn. This was now my first time seeing it, and I have to say, Toni picked out a perfect location! I was still contending with snow, but the wind was not nearly as bothersome as it had been. Between the roadway and the barbed wire fence, I was restricted in my possible shooting locations, which affected my compositions and my lens choice. Due to the distance, I was happy leaving my 24-70mm lens in place and found that to be the perfect range for this subject. Using only my polarizer filter, I was able to keep the lens hood on to protect the glass from the falling snow. I started with the basic full on 3/4 shot that we had seen from the road. This worked out very nicely because there was a skeletal tree to the left, and a small shed to the left of the tree. These three elements worked together almost seamlessly to form the above composition. The textures in the wood, trees, and the tin roof with rust told the story of hard use, and rugged conditions. I was almost happy with this composition, but decided that since I could still feel my fingers, I would keep going and see what else I could work with. I had noticed another barn that was rather...well...blah to the far left of the barn I had been photographing. As I walked to the left, I started to see some potential in that barn. 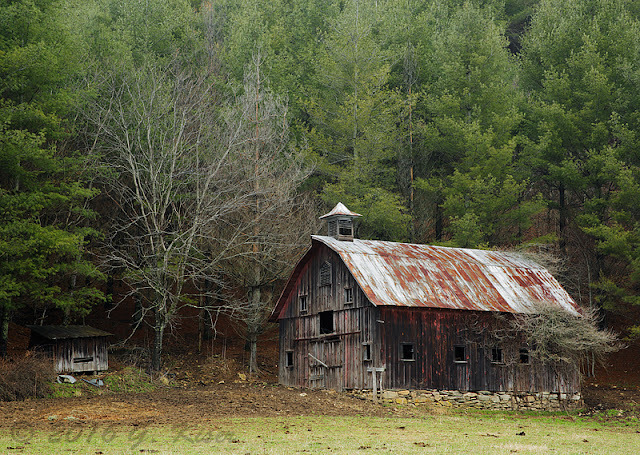 While it wasn't strong enough to be a primary subject, it seemed to complete the story of the larger barn. 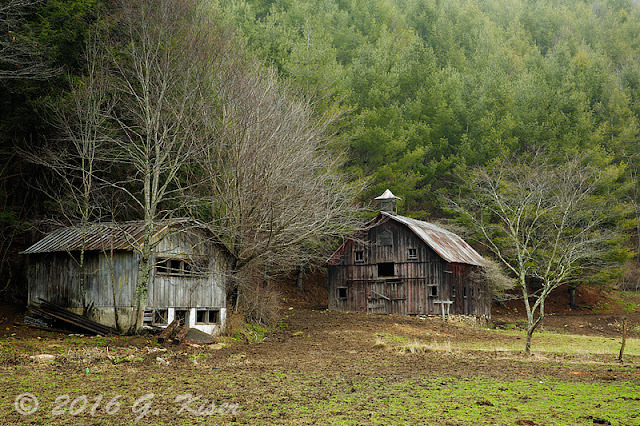 The surrounding trees helped to minimize the impact of the second barn, and also help to push the eyes to the centerpiece of the image. There was another bare tree to the right which then framed the larger barn, and kept the eyes from leaving the scene. Yeah, this composition would work out nicely! It took but a few moments to get the camera positioned right. Everything just fell into place, and even though my primary focus of the scene was in the background, the trees along the foreground bring your eyes right to it. Something that rarely happens in Winter was also happening in this shot. There were a lot of green trees in the distant background which was very beneficial considering my main subjects were all more or less natural wood colored. The difference in colors really helped to bring a visual separation to the elements. 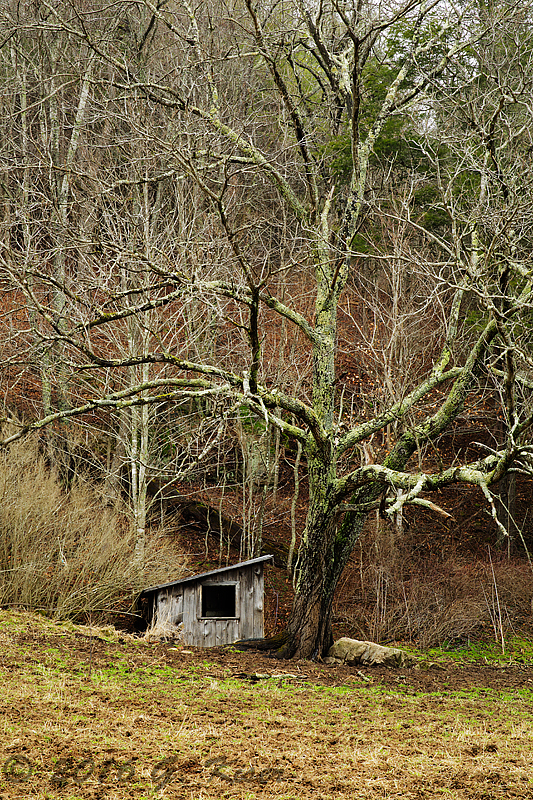 While I was working that composition, I happened to look at a little small shed off to the side. I had seen it before, but it hadn't really captured my attention at the time. It was still not something that I wanted to photograph, but from this particular angle, the tree that it was sitting under was magnificent. Before moving from this location, I flipped the camera on its side and twisted the polarizer a tad in an attempt to capture what I was seeing. The composition fell into place without even a hesitation. The tree added visual importance to the shed, and the shed added visual importance to the tree. The added contrast from the polarizer gave the tree just enough oomph to stand out from the trees in the background I thought. This one shot was all I felt I needed, and I thought that I had nailed it. After I shot this one frame, I picked up the camera and started to move to a different location to try another angle on the big barn. As I passed the truck, Toni caught my attention and suggested that I do something with the little shed. It doesn't happen often, but I got to tell her I had already seen it and shot it. Normally, we are drawn to slightly different subjects. That's why I like having her with me. She will point out things that work very well, that I might miss from time to time. This time, I just beat her to it. As much as I liked this image in the field, and on the LCD, I knew it was going to take a bit of massaging to make it work in a print. The tree that caught my eye was thicker and visually heavier than the competing trees to the rear. However, I was going to have to work with the tones of the image in order to get it to really stand out. There were not much colors to work with, so it was all going to be lighting, shadow and highlight. I worked up the color image and felt that I had a very strong image in front of me. When I made up the proof print, my thoughts were confirmed, yet there was something that was missing. Knowing that I had processed the image with a concentration on light and dark, I figured that what was missing was a lack of color. When I made the monochrome conversion, I liked what I saw, but it wasn't all that different. I discarded the idea for a little while and then came back to it. I made some custom tweaks to the green and red filters after the conversion, and then fine tuned the contrast once again. When I printed out the proof, the final image was exactly what I had envisioned at the time of capture, I just didn't know that I was seeing it in black and white. My initial reaction from the weekend was that this was my favorite image of all that I shot. Things were going great, and the weather was getting a little bit better. However, it was starting to get late, and we were needing to wrap things up. Admittedly, I took the scenic route back into town, but I saw nothing else that caught my eye. I had managed to work two different scenes and felt really good about what I had captured. I had shot less than 30 frames and was excited about pretty much all of them. The next day, and our final full day, Toni and I headed back out once again to see what else we could find to photograph. I was out looking for some old iron as that was what I was really wanting to photograph. Unfortunately, we found nothing at all that caught our eyes. We went into Boone and had our anniversary dinner before heading back to the cabin. On the way back, I was thinking about anything that I could try in the night hours before we got back to the cabin. 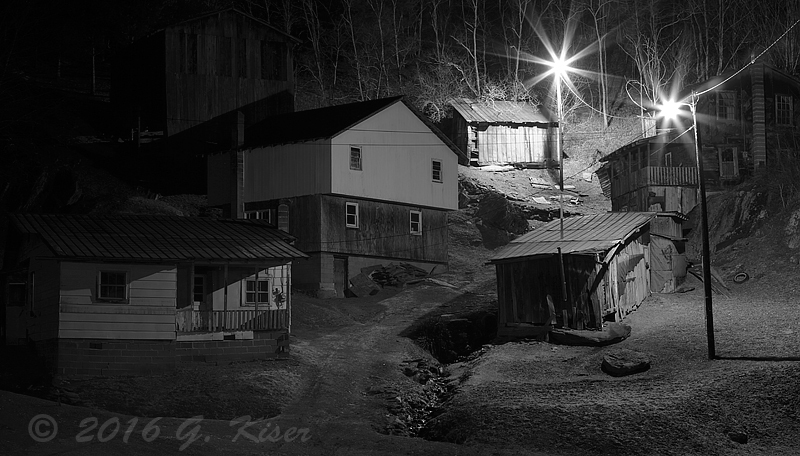 I got this wild idea to try an old tobacco farm I had photographed a couple of years ago which I thought had at least one street light in the middle of the property. It was kind of on the way back to the cabin, so we decided to give it a go. This farm is unlike anything that I have ever seen before. It is set up on the side of a pretty steep hill, and has structures from many different generations. I'm not sure about currently, but in 2013, there was still a resident in the house to the lower left who had worked this farm since he was a kid. I had so much fun photographing this farm in the daylight, and I was really looking forward to seeing how it played out at night time. When we arrived, I immediately saw it from the road which was a great sign. Not only was there one light, but there were two within the property. This provided a lot of great lighting to the scene, and allowed me the ability to photograph it in the pitch black of night without the need for additional lighting. Since I was going to be a good bit further away than I was last time, I mounted my 70-200mm lens for that added reach and compression. There was no need for any filters, but I did use my lens hood to block the element from the street light I was standing under. This lens worked out perfect for the scene. My biggest problem was that the street lights had to be part of the composition due to the pitch of the property. That lead to really bad lens flare along the lower left corner of the image. The lights were also mismatched being both tungsten and white fluorescent. The two different color casts really didn't work well for the scene unfortunately. I shot this with the intention of converting to a monochrome image, knowing that to be the best way to deal with the color temperatures. The scene had a total range of lighting as well. There were the lights which were easily blown out, and then there were dark shadows. It was difficult to get a good exposure using the light meter, so I decided to wing it. I set the camera to bulb mode, and dialed in a medium aperture for full depth of field. I then tried a 1.5 minute exposure and followed up with a full 2 minutes when I saw that things were still a bit dark. On my second attempt, I found the right exposure for the image which was pretty impressive since my last long exposure shot was a couple of years ago. I only took four frames as I was starting to get too cold to function once again. There wasn't much I could do with the composition either unless I tried to make contact with the owner to get permission to get onto the property once again. It was too late for that, so I decided to pack it up and head in for the night. Ironically, I thought that this particular scene would require the most work due to the lighting issues, but the processing went surprisingly fast. I was able to crop most of the lens flare out from the bottom (by design) and was able to clone out the rest without having to work within any structure. The monochrome conversion went very smoothly as well, and I was able to retain much more of the shadow detail than I had suspected. I'm not sure how much I like the image, but it does have merit. More importantly, I'm happy that my off the wall concept actually worked out so easily. The tobacco farm was my last image from the weekend as we had to head home the next day. There might not have been a huge amount of pictures created over the long weekend, but I have to say, what I did capture, I'm very pleased with. Of 32 exposed frames, I am looking at six proofs on my desk. That is about a 20% keeper percentage which is pretty darn good. The vast majority of the pictures I owe to Toni's eye though. She is really great at spotting subjects, and most of the time, I can translate her vision into a working composition. I'm just really happy that she can join me on these Treks!